Phuphrabat Historical Park is part of the Tentative list of Thailand in order to qualify for inclusion in the World Heritage List. Thailand is planning to propose Phuphrabat as a World Heritage Site in 2016, the news really made me want to write the review of this strange historical park in the Northeastern part of this country near the city of Udonthani. My trip to Phuphrabat, the place actually sounds like Poo – Pa – Baht, was happened because I saw its picture when I visited Ban Chiang. The hotel arranged a car with driver for me to visit the place in the next morning. When I arrived in Phuphrabat Historical Park, I was surprised that the place was really quiet and no tourist at all. My driver and I walked into the forest which is a typical sight in this region, after 15 minutes, I started to see the strange shaped rock formation behind the trees. The biggest and most stunning rock called U-Sa Tower. The rock shape looks like a big unfinished Winged Victory of Samothrace in my opinion, but for my driver a big mushroom. Ancient people also made a small room attached to the rock which made the rock more unique, similar to US’s Mesa Verde. In front of U-Sa Tower also have ancient standing stones which historians believed to be the symbol of sacred precinct for ancient ceremony. Then I continued my sightseeing to see more bizarre rocks that named as coffins of ancient royalties. 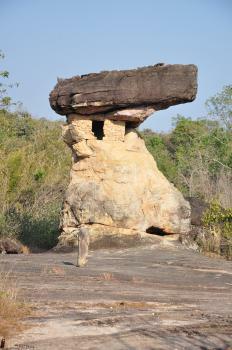 I also saw ancient Buddhist rock cravings and rock arts which actually in my opinion not really interesting. Luckily I met a group of university history class students and their professor was willingly to explain the significance of the site. Later I found out that that professor is a very famous historian in Thailand. According to my guide, most of these bizarre rocks have unique purple color oxidization that really different from other rock in this region that ancient people linked the strange color with lotus petal, the symbolic flower of Buddhism, and that strengthened their belief that this area is a sacred precinct for not only in Thailand but including Laos. He also showed me many impressive ancient standing rock, most of them are taller than me. The guide pointed out that Phuphrabat has been used for religious practice since ancient time even before this region adopted Buddhism as their faith. He even mentioned that even today locals still come to practice Buddhist ceremony in Phuphrabat since I saw remains of candles on the ground. Phuphrabat in my opinion is very unique place of Thailand or even in this region. The 3,000 years old human evidence with bizarre shaped rocks is very exotic and so African more than Asian sites. The site is not beautiful but very interesting to see, if you have a good guide. I am not sure for this place’s World Heritage Site worthiness, but pre-historical cultural site is much underrepresented in Southeast Asia mainland, apart from the Plain of Jars in Laos; Phuphrabat is a very good place to fill this gap. I understand that there are two parts to this nomination. I however only visited the main part where all the strange rock formations are located. This is an interesting site and it is still possible to find evidence of how the unusual rock formations with huge boulders balancing on often smaller ones were used for religious purposes. These rocks take their shapes apparently because of under-sea erosion that happened millions of years ago. Traces of prehistoric rock art can also be found on some of the rocks and a number of these paintings were hardly visible. It is almost necessary (unless one has done quite a bit of research and has a very sharp eye) to have a guide to point them out for the ordinary visitor. Someone had to actually point one such painting out with a long stick to me before I could see it. The kind man who pointed it out to me told me that it was an elephant but I had to stare at it for quite some time before I could even see that it sort of resembled an elephant. The historical park is located entirely within a forest park although being in the "drier" (dryness in this case being a relative concept) part of Thailand it is not quite wild tropical Asia. It was nevertheless still a rather wild place and a snake basking on one of the rocks scared the living daylights out of my guide. I found the place rather enjoyable to visit and take a walk in (notwithstanding the presence of snakes basking so openly on rocks) even if the novelty of the weird rock formations wore off for me after a while. The park is also still somewhat off the beaten track for most travellers, as with northeastern Thailand in general, so they do not seem to get many international visitors there.